The new edition of Scott Foresman English is a balanced, four-skills program for young adult readers that combines a strong treatment of reading and writing with an explicit presentation of learning strategies for academic success. . 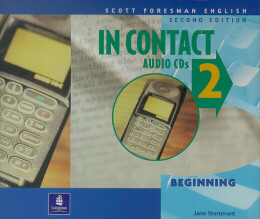 In Contact emphasizes vocabulary building and a balance of controlled and communicative grammar practice. Listening, speaking, reading, and writing strategy activities foster independent learning and prepares readers for success. Thematic units teach English through a variety of high-interest content and clear grammar presentations. Aimed at high beginning ESL Readers. In Contact emphasizes vocabulary building and a balance of controlled and communicative grammar practice. Listening, speaking, reading, and writing strategy activities foster independent learning and prepare students for academic success.